Japanese early to mid 20th century Ando cloisonne vase. 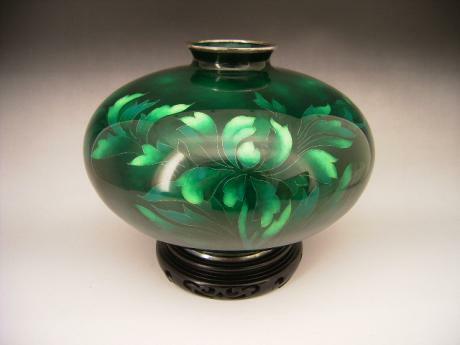 The vase is done in beautiful shades of green with a floral design. Vase comes with pure silver rims. Ando mark on bottom and "JUNGIN" stamped on bottom rim. The vase comes with wooden storage box and wooden stand. 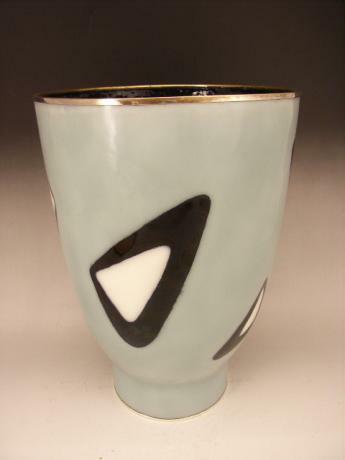 The vase measures 6 1/2" ta..
Japanese early 20th century trumpet shaped vase of modern design. The black vase has white design and silver cloisonne in the upper part of the vase. Unfortunately there are some hairline cracks on one side of the upper area of the vase. No box. 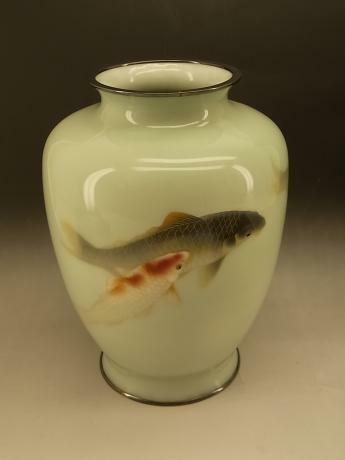 The vase measures 11 1/4" tall and 8 5/16" in di..
Japanese early 20th century KOI design cloisonne vase by the ANDO Cloisonne Company. The vase has 2 KOI done with wires and a single KOI done without wires. The vase comes with pure silver rims and the rim is stamped JUNGIN, or pure silver on the bottom. 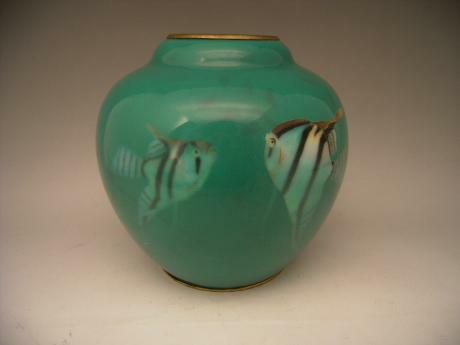 The Ando mark is also on the bottom of t..
Japanese early to mid 20th century cloisonne vase. 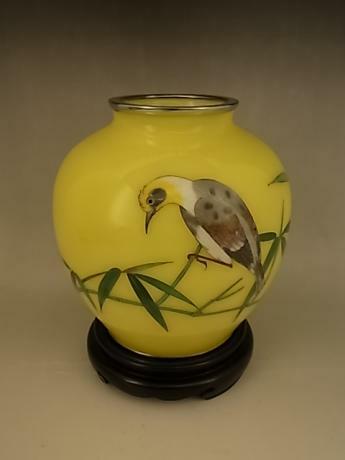 The vase is of a bird and bamboo done in beautiful colors on a yellow background. 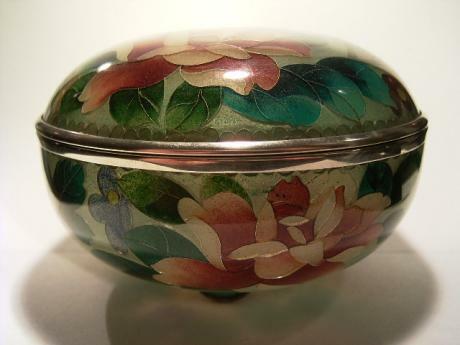 Made by cloisonne artist OTA HIROAKI. Character for HIRO on bottom of vase. 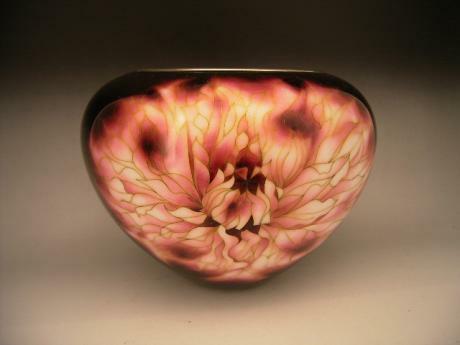 The vase measures 4 7/8" tall and 4 7/8" in diameter. Comes with TOMOBAKO, or original wo..
Japanese mid 20th century modern MUSEN design cloisonne vase. The vase has the character IMA or KON on the bottom, for the artist name, KOUKON or TAKAIMA. Comes with TOMOBAKO or original artist signed wooden storage box. 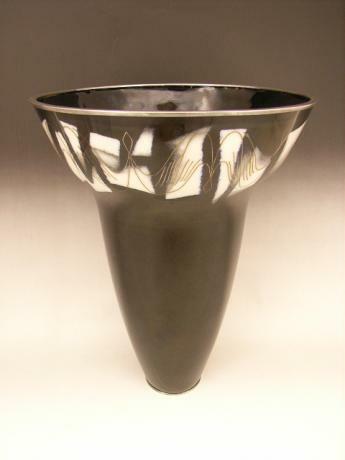 The vase measures 10 1/8" tall and 7 1/4" in diameter at the top rim. 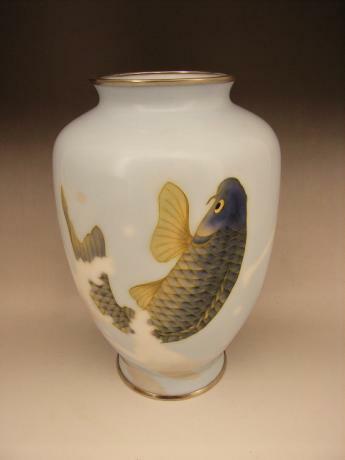 The..
Japanese Early 20th Century angelfish design cloisonne vase by the Inaba Cloisonne Company. Two beautiful angelfish and aquatic plants against a bluish green background. One of the angelfish is done with gold wires and the other angelfish and the aguatic plants are done without wires. 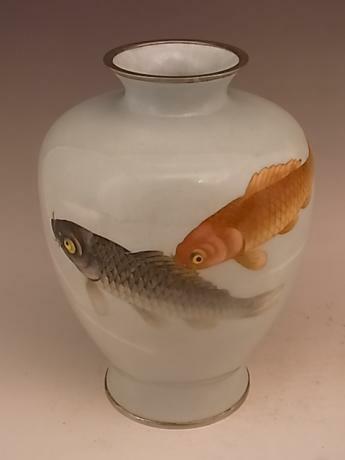 The vase h..
Japanese early 20th century Koi design cloisonne vase made by Shobido company. Shobido is the name of the famous jewelry and art store in Osaka, Japan, that has been in operation since 1900, or the 33rd Year of the Meiji Period. Shobido has been selling jewelry, fine watches and clocks, Japanese..